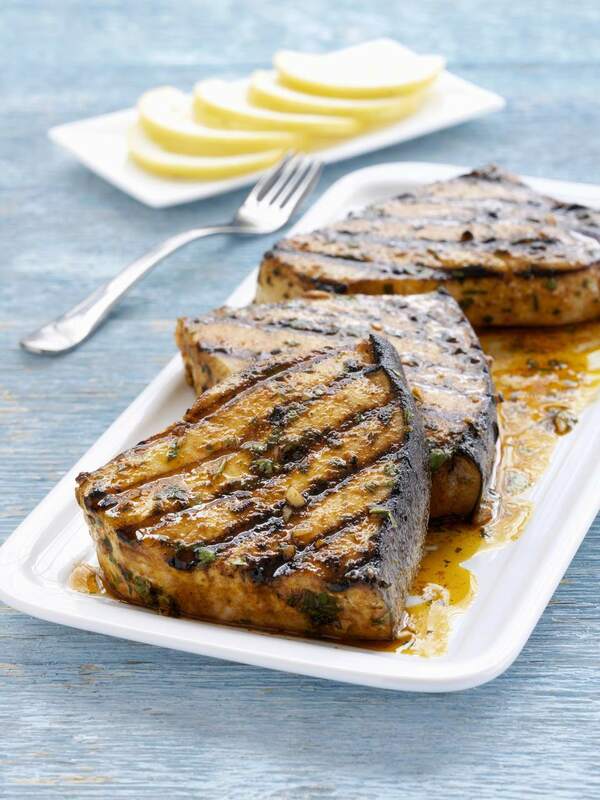 I haven't had grilled swordfish steaks in quite a while, so when my next-door neighbor offered me some swordfish I was happy to accept. The steaks weighed in at about 6 ounces each - perfect for one - and he gave me a couple - perfect for two. I spent a day or two looking at recipes but finally decided on a simple preparation that would simply highlight the naturally fresh, sea flavor of the steaks. This takes no more than 15 minutes of hands-on time to make so it's a great weeknight meal. Serves 2. Place steaks in a plate and squeeze the juice of half the lemon over them, coating both sides. Marinate for 30 minutes. In the meantime, heat a grill pan over medium-high heat. Brush both sides of steak with olive oil then sprinkle one side of each steak with 1/2 teaspoon of Herbes de Provence and a pinch of salt. Place steaks on hot grill and cook for about 5 minutes - until edges of steak are cooked halfway up. Flip steaks and cook another 5 minutes. With a sharp knife, probe the center of the steak to be sure it isn't pink but is still juicy. If it isn't quite done, remove ​the pan from heat, cover with foil, and cook off heat for another 5 minutes. Squeeze a bit more lemon juice on steaks and serve.